One of the peaceful yet fancy weekend getaways is Puducherry where people of all age with divided purpose can visit. The quirky specialities of Puducherry are its French Colonies. So where is it? How to go? Knock Knock! We have good and bad news for you. Bad news first, if you are living in the world where you think you can book an Uber or hire an Auto and drop off at the French Colony in Pondy, nope, that's not possible. Because there is no such particular thing. Period. And here's the good news, There's White Town! Ta-da! So, the White Town, one of the hustling bustling area of tourist attraction has hotels, Airbnb's, cafes and altogether that's the French Colony you have been dying to go to and click install worthy pictures. So, all around White Town, there's a criss-cross of streets (Rue in French). Most of the buildings are a mix of European and improvised modern architecture. The boutique cafes and art galleries have tried their best to hold onto the French remain to evidently keep the status of French Colony. The bureaucratic offices also have the essence of French artworks. Most importantly, the vibrant colours, typically yellow and orange and green and peach give away vibes very similar to a quintessentially colonial era. 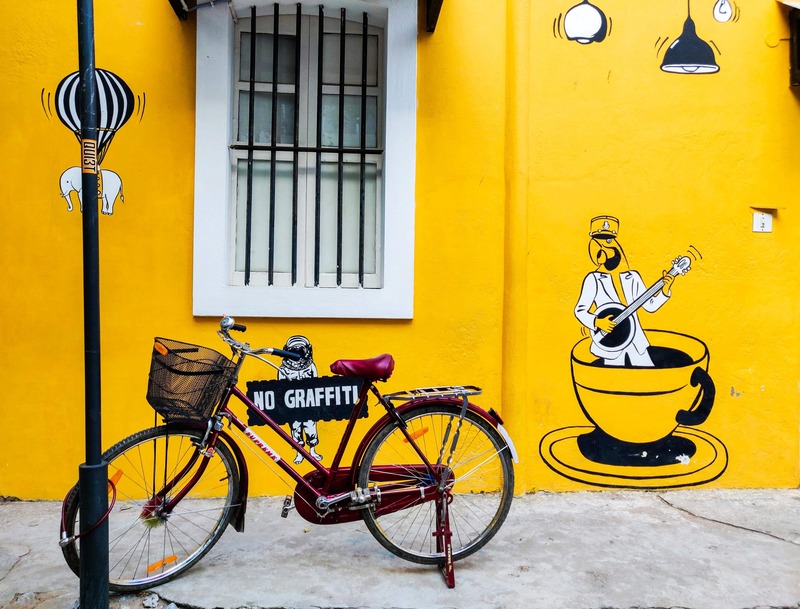 So, when you plan Pondy, keep 3-5 hours in your hand, preferably early morning to savour in the exceptional beauty of the ordinary residential White Town which is nothing but the very famous French Colony. The demarcations are not profound, you need to take a lot of turns and get lost sometimes to find the street where your heart skip a beat. Also, there's not just one street that has everything. What takes to discover the best is a wanderlust soul and meticulous aesthetic sense. All hotels generally rent two-wheelers at the price of within 300-500 per day. Also, there are rare options for renting Cycles. Personally, I would suggest nothing better than on foot expedition.